Congratulations! You're engaged! 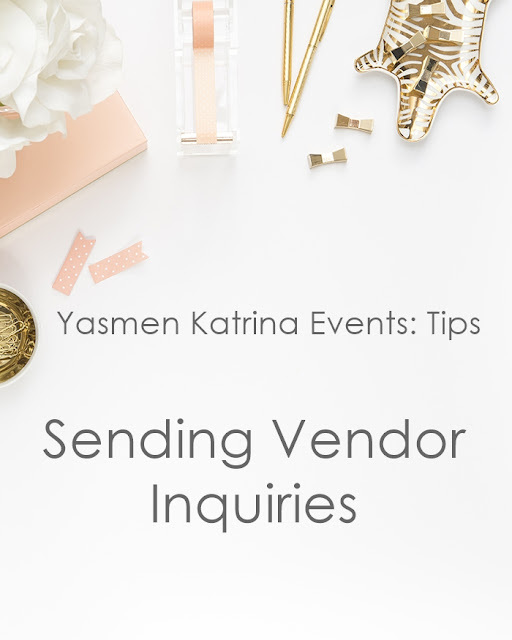 Generally the first thing you do when choosing a wedding vendor is inquire. This is YOU (the couple) requesting for a wedding vendor to contact you. Most inquiries are done via the vendor's websites contact form, or a direct email to them, if you call them directly these same tips can apply. Email: Be sure to include your email when you fill out the form. You may not know, but when you fill out the form it doesn't show us (vendors) where the email came from. Phone Number: Leave a phone number because some emails do bounce so a vendor can follow up with a phone call. If you prefer to be contacted by email you can always write that in the notes or comments section. Wedding Information: ALWAYS put your wedding date, if you don't know it yet you can always put an estimated date. This way a vendor can automatically see if they are available to provide you with their services, or if they are already booked. It is also helpful to add the location of where you want to get married, and the service you are looking for. Best Time To Contact You: Vendors understand that you are busy, just write a little note about when is best to reach you. Read The Vendor's Website: Some vendors sell packages and they put them on their website with pricing. Others state they have custom packages and list starting prices (I do that). So when you ask a vendor to send pricing who have custom services won't be helpful, because they can't price it. However they will tell you a range of their pricing. This simple tips will help you and the vendor save precious time.